The silent cinema was America's first modern entertainment industry, a complex social, cultural, and technological phenomenon that swept the country in the early years of the twentieth century. 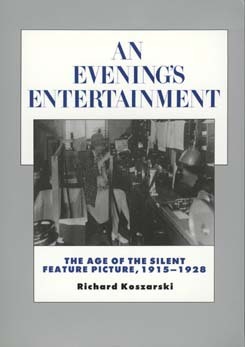 Richard Koszarski examines the underlying structures that made the silent-movie era work, from the operations of eastern bankers to the problems of neighborhood theater musicians. He offers a new perspective on the development of this major new industry and art form and the public's response to it. Richard Koszarski is Head of Collections and Exhibitions at the American Museum of the Moving Image. He is author of The Man You Loved to Hate: Erich von Stroheim and Hollywood (1983) and editor of Film History.